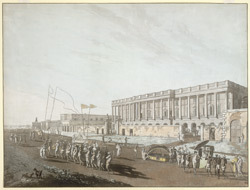 Coloured etching with aquatint of the New Court House and Chandpal Ghaut in Calcutta by Thomas Daniell (1749-1840) no. 5 of his 'Views of Calcutta' published in 1787. Chandpal Ghat is situated on the River Hooghly at Esplanade Row and was once the official landing stage for important visitors to Calcutta. The Supreme Court building, with its long colonnaded verandah, was opened in 1782. The orientalist Sir William Jones was judge here from 1783 until his death in 1794.